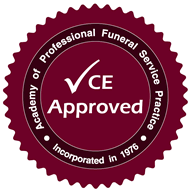 Funeral Directors and Embalmers in Montana are required to complete 6 hours of continuing education annually. Of those 6 hours, 1.5 are required to be in reference to the FTC, other regulations, and/or ethics. Except as provided in ARM 24.147.2102, the Montana State Board of Funeral Service does not pre-approve continuing education courses or sponsors. The following courses meet the Board’s standards for continuing education.